The patrons were list’ning, alert one and all. In hopes they imparted good holiday cheer. As all through December we mingle and eat. That our singers had not eaten dinner or lunch. The conductor was wondering what had gone wrong. Their stomachs were growling, and craving some food! Their hunger induced them to mix up the words. They sang not of Christmas, but of feasting instead. Can’t help but insert thoughts of holiday treats. 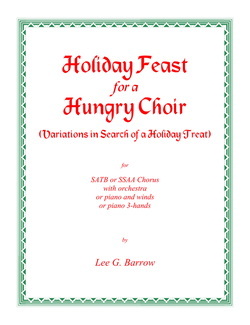 This clever holiday farce begins with "Now bring us some figgy pudding," then breaks into a quodlibet of numerous well-known carols, with the words corrupted to talk about food. Included in the medley are "O Come, Have a Plateful," "Carol of the Smells," "Deck the Hall with Rolls of Jelly," "Ding Dongs and a Cherry Pie," and many others. It is accompanied by piano, or piano and percussion, or piano, 8 winds and percussion, or orchestra.